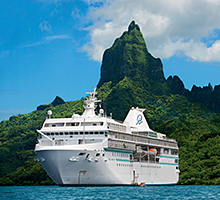 Paul Gauguin Cruises offers luxury, small ship voyages in Tahiti, French Polynesia, and the South Pacific on the award-winning, 332-guest m/s Paul Gauguin. Built specifically to navigate the islands of French Polynesia, the Gauguin features a small size that allows her to access lagoons that bigger ships can’t, creating countless intimate, private, and exclusive opportunities to explore. 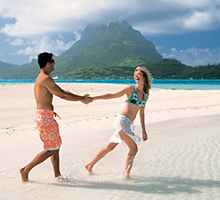 The Gauguin is renowned for its award-winning service and luxury appointments. Nearly 70% of the ship’s suites and staterooms offer balconies. Dining experiences include L’Etoile, which showcases an array of tempting specialties, expertly prepared each evening. La Veranda features delicious breakfast and lunch dishes and is transformed into a chic French bistro in the evenings, highlighting culinary creations of celebrity chef Jean-Pierre Vigato. Polynesian specialties are served poolside at Le Grill. 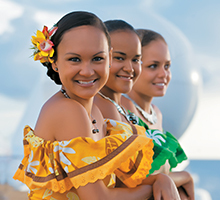 Naturalists, lecturers, and the Gauguines and Gauguins—a troupe of Tahitian entertainers—provide enriching experiences of the destinations throughout each voyage. A luxury spa, fitness center, a watersports marina, and expansive outdoor decks with chaise lounges and a pool are also available aboard The Gauguin.